Saving money doesn’t come easily to some people. How much you can save depends heavily on your budget. Some people feel like they don’t have enough left over to save each month. Others may have committed to saving a fixed amount of their income like 10% of every paycheck which is great. Over the past few years, I’ve been obsessed with this super saver method of saving 50% or more of your income. While this may sound intimidating, some people actually manage to do this. Saving an aggressive amount of money can help you reach certain goals quicker including paying off debt, traveling more, and even retiring earlier. Here’s how to save 50% of your income if you’re just getting started. 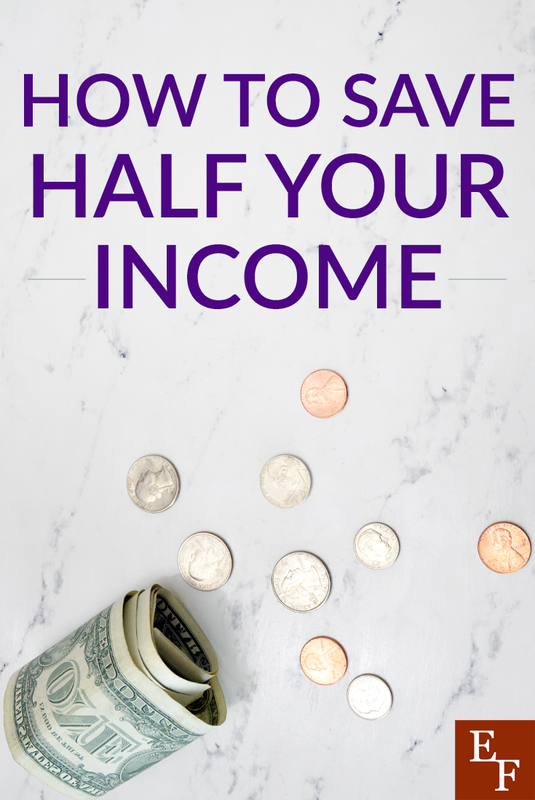 If you’re trying to figure out how to save 50% of your income, you’ll need to start by facing the facts. It’s obvious, but using this savings method means you’ll have to live on only 50% of your take-home income. For most people that’s a stretch, but it’s easier to manage if you earn more money. That’s the next fact you’ll need to face. It’s much easier to save 50% of your income when you make more money. That said, it’s not impossible to make it work. I was able to achieve a 50% savings rate while only earning around $36,000 per year. The final main fact you’ll need to consider is that this is not going to be a walk in the park. The average American has trouble being able to afford a $1,000 emergency. Saving aggressively is not particularly easy to do, but it’s well worth it if you really want to get ahead financially. So here’s how you can do it. Setting a monthly budget is great, but at times I find that using a budget puts me into a routine. I get comfortable with certain expenses which can make it harder for me to question some costs and figure out how much I’m spending over time. This is why I always recommend annualizing your expenses at least once or twice a year. Just take each monthly expense in your budget and multiply it by 12. Add in other yearly or bi-yearly expenses then total it all out. You may be surprised to see how much you’re spending on certain costs. Or, you may even be surprised to see how little you’re spending. Either way, it’s a great way to put things into perspective as you start to determine how you can save 50% of your income. If you’re earning $60,000 per year but you’re spending about $47,000, you’ll see that you may need to cut your spending by $17,000 to meet your goal. Saving 50% of your income is a huge goal. It’s best to get everyone in your household involved you can be on the same page. Talk to your partner and kids about the big decision and get their feedback. Try to position it as a team effort and get clear on why you want to do this. Highlight the benefits of having a 50% savings rate and be realistic about how your lifestyle may change and what everyone’s exceptions are. If you have a dual income household, you may want to consider living on one person’s income and saving the other income to get into the habit of saving more. We all knew this was coming. In order to reach a huge and unique goal, you’ll have to change your lifestyle and live a little differently. Once you annualize your expenses, you’ll get a clear picture of what is costing you the most money. For most people, expenses like housing, transportation, childcare, and food are the most expensive. You can start by determining how you can reduce some of those larger expenses to generate huge savings. Can you move to a cheaper place if you rent? Would you be able to get a roommate or refinance your mortgage if you have a house? If you and your partner both have a car, maybe you could downsize to a one car family and save money on gas, repairs, and insurance every year. You can also focus on small expenses and hacks to help you save. Sure, avoiding coffee and making your own at home instead may not save you $10,000 each year, but it all adds up. Audit your memberships and subscriptions, explore cheaper childcare options like home care, or even see if your employer can help cover some expenses. I know some companies that pay for gym memberships, childcare, and even office supplies for their team. Everyone’s situation will be different, but the key is to start looking for ways to cut costs that won’t make you feel super deprived. If you’ve cut some costs but still feel like you’re not able to meet your 50% savings rate goal, it’s time to focus on earning more. I recommend getting a pay increase with your current employer, finding a new job that pays more or considering a profitable and sustainable side hustle. There are so many things you can do to make extra money on the side. However, you want to find something that’s profitable and sustainable. Sustainability is key if your side hustle to help you save 50% of your income because you may need to do it long term. You want to be comfortable with your side hustle, enjoy it, and be in it for the long run. Some sustainable extra income ideas you can consider include babysitting, freelancing writing, virtual assistant work, editing/proofreading, transcription, fitness class instructor, delivering packages with Amazon, driving for Uber or Lyft. These are all flexible work ideas that you can do for years if need be. I’ve been freelance writing for the past 4 years and I have some clients that I’ve been with for the past two years or longer. The second client I ever got is still a current client. While freelancing isn’t guaranteed (no job is) it brings me comfort to know that I can make a certain amount of money each month and even increase my earnings if I wanted to look for more work. Brainstorm to find your ideal sustainable extra income idea. Consider how much you need to make along with how much time you want to commit. You can find great extra income opportunities that only require 5 to 10 hours of your time per week. Most people can save half of their income, but they just make certain lifestyle choices that prevent them from making this goal a reality. You’ll have to live well below your means but you don’t have to feel deprived. Try to control some of the most costly annual expenses and make a list of the things you want to keep in your budget along with what you’ll get rid of. Get the whole family involved and consider increasing your income to make it seem more feasible. A person who earns $50,000 per year will likely find it harder than someone who earns $100,000. Still, both people can figure out how to save 50%. What about you? Have you ever thought about how to save 50% of your income? What would your plan look like?